Bake sales come in all shapes and sizes. They can happen at a church, in a neighborhood, at your school or office. They can even be virtual — just you and your network. 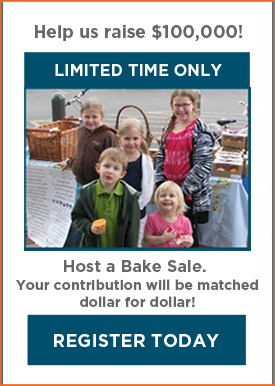 Great American Bake Sale is a big part of Share Our Strength's work to end childhood hunger in America. Since 2003, Great American Bake Sale volunteers and sponsors have helped raise more than $8 million to feed hungry kids in America for the No Kid Hungry campaign.We’re inviting you to join the fun. Throughout October, Domino® Sugar and C&H® Sugar will donate $25 to No Kid Hungry for every person that registers for Great American Bake Sale up to $25,000. Then, in November, they’ll match every Bake Sale dollar contributed up to $75,000. Help us get there. Sign up today and get all the tools you need to start planning your bake sale. And your registration will trigger a $25 donation to the campaign. This year, my family hosted a Great American Bake Sale. I loved it because I knew it would benefit the children in America who are hungry (and because I love baking). More than 30 families and businesses donated goods or supplies. Volunteers helped with set up and clean up, and my entire family worked the sale. Together we raised over $2200! Please join Kate and thousands of others across the country who are baking, spreading the word, and raising money to help end childhood hunger in America. See you at a Bake Sale. Sign up today! What a great idea for kids! I loved reading Kate's story. Thank you for sharing this fabulous cause. What a wonderful way to raise money for No Kid Hungry. This is a great cause! I am glad you took the time to highlight it and share it with us. I have shared a link to this post on my FB page.